Mike & I just got back from Sedona yesterday and I’m pretty sure it’s my new favourite place in the world. I’d elaborate more but I’m pretty sure I left my brain back in Sedona so I’m just gonna keep it brief here today. Now back to the real world…With tasty dinners! Made in one skillet! And cozy fall vibes! Altogether you need only nine simple ingredients and one skillet to make – it’s super easy to throw together and is ready in under 30 minutes. Quickly sear your pork steaks with a little salt and pepper on a medium high heat. 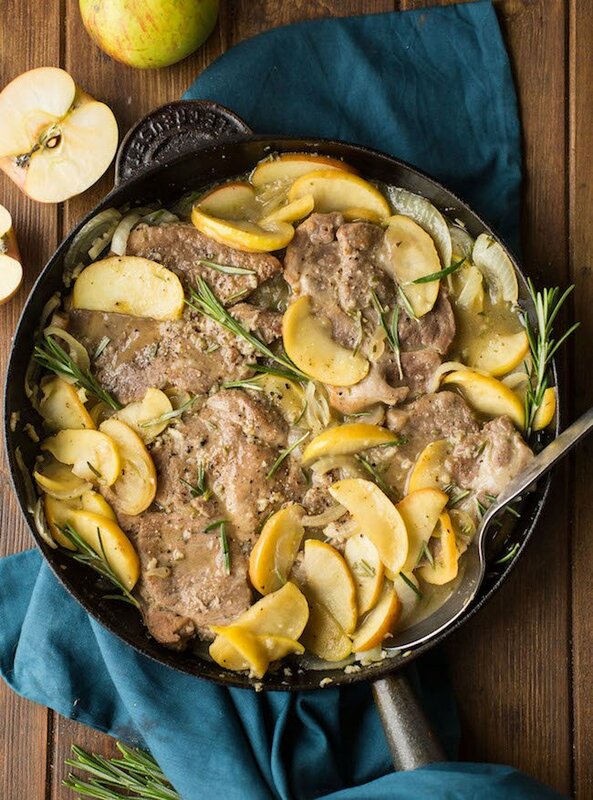 Once browned, add your cider & garlic to the pan and let those juices soak into the pork before adding chicken stock to keep the pork moist. After the steaks are cooked through remove them from your skillet and set aside on plate while you move onto the next bit. Add your apples, onions and rosemary to the same pan and sauté in leftover liquids and additional cider for about 5 minutes. 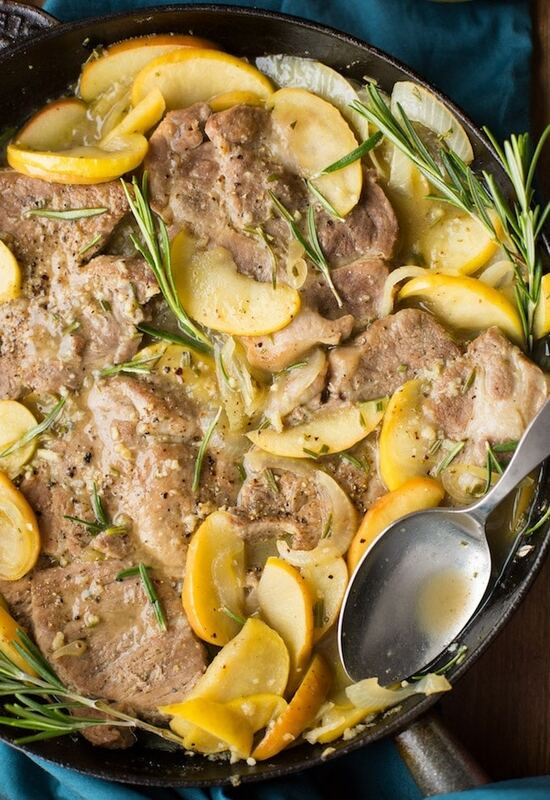 Then just add the pork steaks back to the pan, toss everything together and serve. Easy as that! With all the Christmas baking that’s about to go down I have a feeling this dish is gonna make a couple more appearances before the season is up. It makes for a really quick and easy week day dinner that doesn’t require too much effort. Plus it means that I need to keep a couple extra bottles of cider around so I’m all for that. 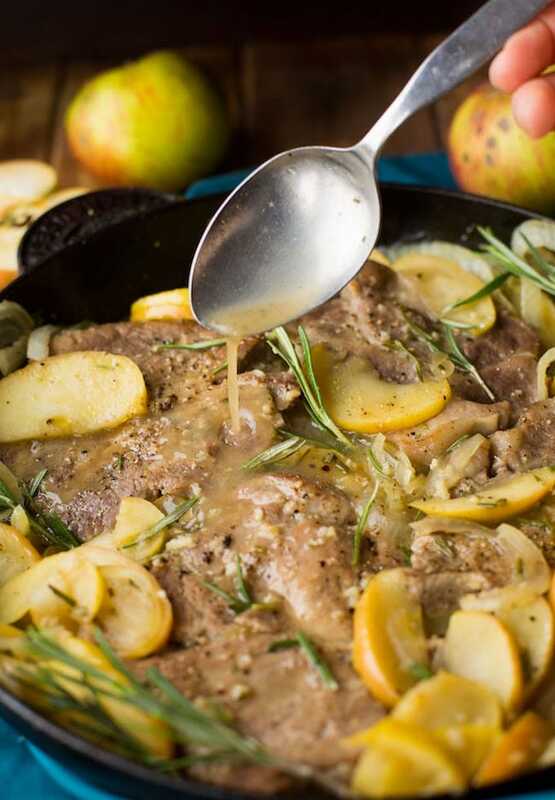 Don’t forget to #asaucykitchen on instagram if you try this Cider Braised Pork! We love seeing what you make! You can also post your pictures to my facebook page! Sprinkle each side of the pork steaks with salt and pepper. Heat one tablespoon of olive oil in a large skillet/frying pan on a medium-high heat. When the oil is hot and is starting to smoke slightly, add the pork steaks and sear for about two minutes on each side, flipping evenly to ensure both sides start to brown. Reduce heat down to medium. Add 1/2 cup of the cider + garlic and continue to cook, turning the steaks one or two times until the cider has almost completely evaporated - approx. 3 minutes. Add the stock to the skillet and reduce heat to low. Cover and cook until done for 10-15 minutes. Make sure to turn the steaks once or twice during that time to keep them tender. Check internal temp is at least 145° F to ensure doneness. Once the steaks are cooked, remove them from the skillet and transfer to a warmed oven to keep them warm. Add the apples, onions and chopped rosemary to the remaining liquid in the skillet, stir in the remaining 1/2 cup cider, cover and let it cook for about 5 minutes on a medium heat. Remove the cover and cook until most of the sauce has reduced. approx. 5 minutes. Yay! SO glad you liked it! Thanks Kimberly!